The SEEC project is now (as of Jan. 2013) based at the University of Chicago Department of Computer Science, although work continues at a number of collaborating institutions. Our paper on using hierarchical Bayesian models to solve energy minimization problems was just accepted to ASPLOS 2015. Our library implementation for meeting performance goals wiht minimal energy consumption was accepted to RTAS 2015. Our paper charcterizing the energy/performance tradeoffs of an ARM big.LITTLE and mobile Haswell processor won the best paper award at the 4th annual Embedded Operating Systems Workshop. Our collaboration with David Wentzlaff's group at Princeton University was just funded by the NSF XPS program, to build Cost-aware Adaptive Software and Hardware systems. Our work on coordinating accuracy-aware applications and power-aware systems was just selected to appear in the 2014 Euromicro Conference on Real-time Systems (ECRTS). Work detailing our collaboration with MIT to create a self-aware processor was just accepted to appear in the VLSI Symposium 2014. 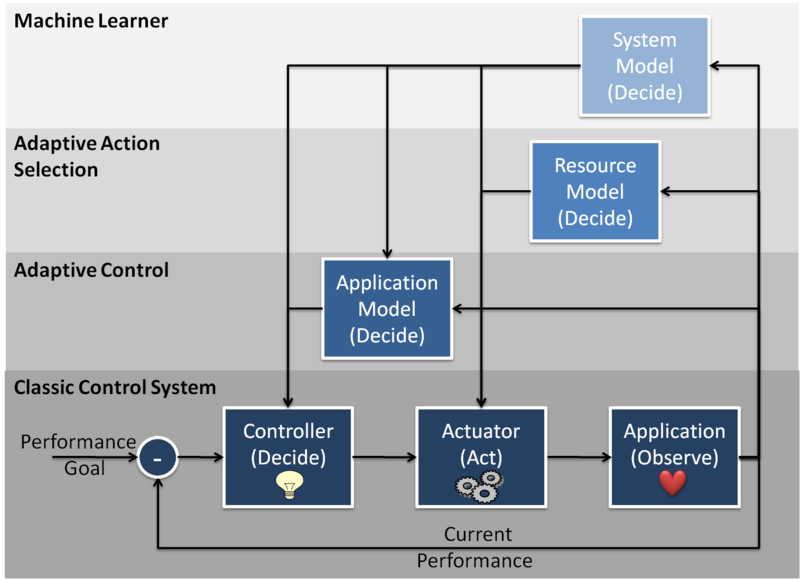 A collaboration with Antonio Filieri and Martina Maggio on automatically constructing control systems for adaptive software was recently selected to appear at the 2014 International Conference on Software Engineering (ICSE). Our recent paper showing the inefficiency of the race-to-idle (or race-to-halt) heuristic was selected to appear at the Workshop on Workshop on Power-Aware Computing and Systems (HotPower). We recently had a paper accepted to EMSOFT that uses the SEEC approach to guarantee performance while minimizing power consumption. We have received funding from the DOE to make SEEC part of the next generation operating system for exascale supercomputers. In collaboration with MIT CSAIL and MIT MTL, we have developed a prototype processor specifically designed to support the SEEC model. The processor is currently under test, we hope to have an evaluation finished in the fall. In Decemeber 2011, the self-aware computing project was named one of ten "World Changing Ideas" by Scientific American. (Unfortunately the article is behind a paywall). As the scale and complexity of computing systems increases, application programmers must not only be experts in their application domain, but also have the systems knowledge required to address the constraints of parallelism, scale, power, energy, and reliability concerns. SEEC proposes a novel approach that addresses these constraints by adding a self-awareness dimension to computational models. Self-aware computational models automatically adjust their behavior in response to environment stimuli to meet user specified goals. The SEEC model is unique in that it supports a decoupled approach where applications and systems developers separately contribute to the development of a self-aware system, each focusing on their area of expertise. Using SEEC, applications directly specify their goals through a standard programming API while system components (e.g. runtime, OS, hardware, & applications themselves) specify possible actions. 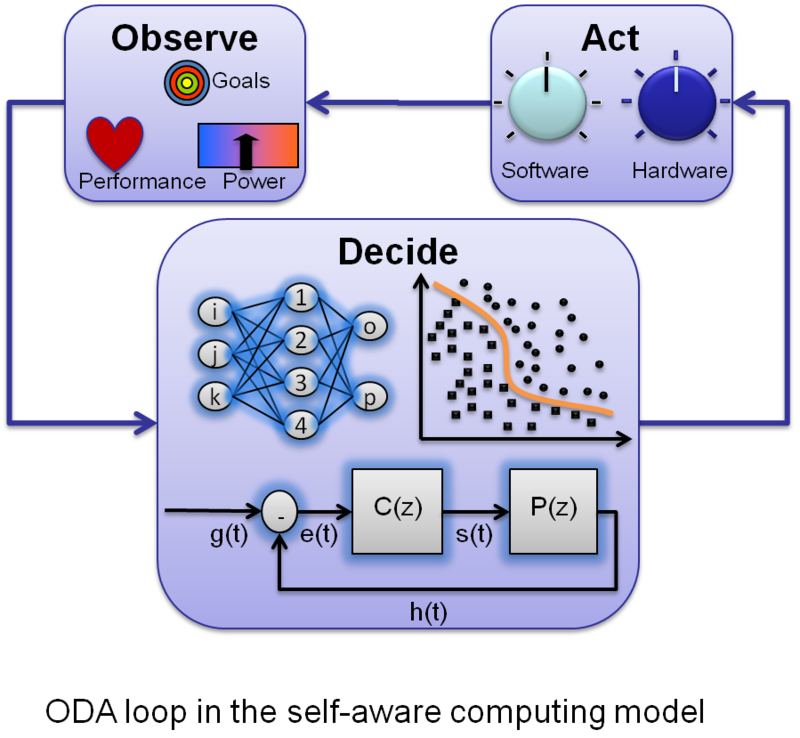 Given a set of goals and actions, SEEC uses analysis and decision engines (e.g., adaptive feedback control systems and machine learning) to monitor application progress and select actions to meet goals optimally (e.g. meeting performance goals with minimal power consumption). (SEEC listed as one of ten "World Changing Ideas" by Scientific American . The article is behind a paywall). A postdoctoral scholar interested in applying adaptive computing techniques to energy managment and resilience. by Connor Imes and Henry Hoffmann. by Antonio Filieri, Henry Hoffmann, Martina Maggio (alphabetical order). by Henry Hoffmann and Martina Maggio. by Henry Hoffmann, Martina Maggio, Marco D. Santambrogio, Alberto Leva, Anant Agarwal. by Jim Holt, George Bezerra, Apan Qasem, Jason Miller, Henry Hoffmann. by Martina Maggio, Henry Hoffmann. by Martina Maggio, Henry Hoffmann, Marco D. Santambrogio, Anant Agarwal, Alberto Leva. by M Maggio, H Hoffmann, AV Papadopoulos, J Panerati, MD Santambrogio, A Agarwal, A Levas. by Henry Hoffmann, Jim Holt, George Kurian, Eric Lau, Martina Maggio, Jason E. Miller, Sabrina M. Neuman, Mahmut Sinangil, Yildiz Sinangil, Anant Agarwal, Anantha P. Chandrakasan, Srinivas Devadas. by Henry Hoffmann, Martina Maggio, Marco D. Santambrogio, Alberto Leva, and Anant Agarwal. byMartina Maggio, Henry Hoffmann, Anant Agarwal, and Alberto Leva. byMartina Maggio, Henry Hoffmann, Marco D. Santambrogio, Anant Agarwal, and Alberto Leva. by Henry Hoffmann, Stelios Sidiroglou, Michael Carbin, Sasa Misailovic, Anant Agarwal, Martin C. Rinard. by Martina Maggio, Henry Hoffmann, Marco D. Santambrogio, Anant Agarwal, and Alberto Leva. by Marco D. Santambrogio, Henry Hoffmann, Jonathan Eastep, Jason E. Miller, and Anant Agarwal. by Henry Hoffmann, Jonathan Eastep, Marco D. Santambrogio, Jason E. Miller, and Anant Agarwal.